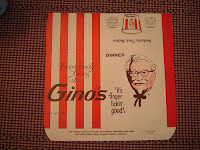 Gino's was my first fast food experience. It was first restaurant to move in nearby, even though we all knew there was a McDonalds several miles up the White Horse Pike, Gino's was five minutes away, and right next to the Acme where just everyone did their grocery shopping. How could you miss it? One visit after a long grocery trip to bring home lunch and I was indoctrinated at a very tender age. I remember loving the fries even then, surely an early sign of the mental illness that troubles me even now. Gino's was huge then. Even the sign, that of a cartoon football player holding aloft a gigantic bucket of Kentucky Fried Chicken, was huge and one of the highest points in Berlin NJ. The home of the Gino's Giant, the later Sirloiner, and of course the Colonel's chicken held a prominent place in my childhood years. I remember one traumatic moment when I was five or six when I was given a soda to carry as we left the counter with our take out, and me being a dumb and clumsy kid, I dropped it. I remember it went everywhere when it hit the floor, and I was horrified. Another fond Gino's memory was when a friend had her birthday party 'catered' by Gino's with Kentucky Fried Chicken her parents brought home. That party was the envy of the neighborhood. The fries at Gino's were long shoestrings, maybe a bit greasy, but always a treat. The novelty of fast food was still a new thing for us hicks back then. The Berlin Gino's eventually closed and later became an Arby's then a Roy Rogers and now it's a Jersey diner, but it has retained its distinctive Gino's structure through the years. Later, when I was in college I noticed they had changed their fries to regular cuts similar to Roy Rogers, not surprising as they had been purchased by Marriott. And then they vanished altogether. Gino's is still missed, and despite what the new Gino's is trying to do, it's not the same. But I still have my memories. Check out the memories of others here. French Fry Diary 163: Gino's Is Back! Who Has the Best BBQ Potato Chips?